As promised, here is our recipe for the best homemade banana muffins. 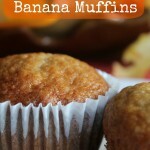 Make sure you have 3 very ripe bananas- this ensures a dense, moist crumb to the muffin. Use whole cane sugar such as Sugar in the Raw or Wholesome – it isn’t overly sweet and bakes really well. Great bakeware like the USA Muffin Pan – they bake evenly and come out perfect! To save you the trouble, of searching any further, here is my version of yummy Homemade Banana Muffins. These are great for breakfast, to enjoy with tea or coffee or as a snack in the lunch bag. A great way to use up your ripe bananas. Delicious homemade banana muffins with just a hint of cinnamon. Combine first 5 ingredients (all dry) in a large bowl; set aside. In separate bowl, combine mashed bananas, egg, oil and vanilla. Mix well. Pour banana mixture into dry ingredients. Stir until completely combined. Bake 18-22 minutes or until toothpick tests clean. Subscribe to our mailing list & get our TOP 5 RECIPES FREE! What is your favorite muffin recipe? Share in the comments below. If you like this recipe, Try our amazing Strawberry-Rhubarb Muffins. This post includes an affiliate link. If you choose to use it, I will be able to enjoy a cup of coffee, for which I will be very grateful! You are so welcome! Hope you like them! I love banana muffins! This recipe looks easy- I might try to make these today since I have everything but the canola oil- can I swap out olive oil or veg oil? This recipe is very easy! And yes, most definitely can substitute veg oil in place of canola. Let me know how they come out! I have some bananas that are just about ready to be used in banana bread or muffins! Get them off the edge and into that mixing bowl! The kids will love them! I love banana muffins too…but I don’t like how store types are too sweet leaving that weird taste in your mouth. You know what I mean? These are just right…and will make the perfect on-the-go breakfast for the kids! Ok, love this … can we use a gluten free flour and see how it turns out? I have a banana BREAD recipe I love that calls for sour cream. I was hesitant at first, but I think it really helps it stay moist. My kids love it (but they refuse the walnuts, sigh. when will they wise up?! ), but muffins are so easy for quick school morning breakfasts for them. I should do this more often. You will like this recipe! The muffins come out super moist and freeze really well! Homemade? Banana? Yep sign me up I’m in! YUMMY! I just made them as I had bananas growing in the kitchen, they look great and am waiting for then to cool to try. Smell delicious. Please let me know how they came out! I would start with 1 stick softened butter and see how that works. Let me know if that is enough…I will have to experiment as well!